We can all agree that everybody who takes care of their health wants to find a healthy solution to preserving food. And what is a better solution than homemade dehydrated meat, fruit, and vegetables?! Commercially dried food is often kept fresh by adding various preservatives that might be the cause of some health issues, mostly related to blood pressure (Source). We are happy to inform you that you can easily avoid those problems by making dried food in your home using organic and healthy ingredients you’ve chosen. Everything we said above gives you an idea why food dehydration is becoming more and more popular. Not only they will save you a lot of money, but also provide your family with healthy homemade snacks. How to Use a Food Dehydrator? What Can You Do and Make? Our Verdict: What is the Ultimate Dehydrator to Buy? If you’re on a budget, but still like to snack on a variety of dried foods, this dryer for food might be the one for you. It has a vertical flow design with a top-mounted fan so that you can make things like fruit or veggie chips, and rolls. This lightweight unit is quiet despite a 600 w heating fan which works with a thermostat. Included with this dryer is a total of four sheets and five trays. Two are with a mesh, and two are without, so users can dry a variety of foods. For example, the solid sheets are ideal for drying purees into rolls. In contrast, the flexible screens work well with herbs. It is also possible to expand this model up to 12 trays in height. This food dehydrator has an air flow design so that you spend less time tinkering and turning trays around. The adjustable thermostat has seven different settings printed above it, from 95°F to 160°F. There is also temperature information for various foods. All in all, the Nesco FD-75A is a great unit for drying herbs, vegetables, and fruit, and comes with a book for food dehydrator recipes. For its low price, this model does a fine job with many foods, but it can take more time than advertised. When we measured the actual temperature, we realized it was off by up to 10 degrees. If you live in a very humid area, you might experience longer drying times as a result. Larger households that need a lot of dehydrated products should take a look at what this model offers. It comes with a hefty price-tag but offers an incredible 15sq feet of space. It’s also not fully automated like some food dryers, but it has good temperature controls to help you out. The first thing you’ll notice about this model is its size and weight. It’s 19 x 17 x 12.5″ and a whopping 22 pounds, so you’ll need to sacrifice some counter-top real estate to use it. Since this is a horizontal flow food dehydrator, the fan and heating element are in the back. When it comes to shelving, this food drying machine has nine plastic trays and fine white mesh sheets. That way, you can dry larger chunks of food as well as smaller slices or herbs. With so many slots available for trays, you can get more height, if necessary, by putting in less than the maximum. To set a drying temperature, users have a dial, and cheat-sheet available near the back of this unit. The dial goes from 95°F to 155°F, which makes the Excalibur 2900ECB good at drying a large amount of food; from herbs to jerky. It also has a fruit roll tray for making leathers. All in all, we didn’t notice many issues while trying this kitchen food dryer out. One of the few things that bothered us was the lid. It seemed flimsy, but it didn’t affect the drying time in a negative way. Those who don’t mind paying extra for a good food dehydrator will be more than happy with this model. It combines stackable trays with a horizontal flow design for excellent results. As an added convenience, you also get a few features which save time and make the whole process easier. At the heart of this dehydrator for food is a 400w rear-mounted fan which works with improved air flow technology. This design prevents overheating and ensures even drying, so you don’t need to rotate shelves. Those who like to set and forget can use the adjustable thermostat, timer and auto shut off feature. Users can program presets for temperatures ranging from 95°F to 158°F that run for up to 19.5 hours. What’s more, there’s a feature that protects from overheating. Out of the box, you get a total of 15 different racks which are adjustable by height. There are six stainless steel mesh sheets, six plastic mesh sheets, and three nonstick sheets. The included trays can handle anything from larger chunks of meat to small pieces of food. 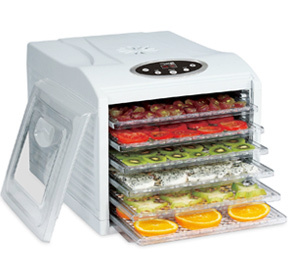 Thus, the Magic Mill is among the ideal dehydrators for drying meats, fruits, and vegetables. Finally, for easier clean-up, this model includes a drip tray. Despite the ease of use and great results, we noticed a few downsides during testing. For starters, the actual temperature can be 5-10 degrees lower than what the unit shows. Besides that, it is one of the bigger units on our test, so it’s not ideal if you lack space. Not everyone wants a top of the range food dryer that comes with a steep price tag. Some people want a reliable and affordable unit to get into the world of dried foods. For those people, the Presto 06300 Electric is a good choice. It is a straightforward and easy to clean device but requires you to spend some extra time. This model comes with a system consisting out of four trays which stack are stack on each other. The heating element and fan are at the bottom and provide steady air flow, so there’s no need to rotate trays. To track progress, you can use the see-through cover. Both the trays and lid are dishwasher safe, so this dehydrator for food is quite practical. In total there are four drying trays included with the possibility to expand up to eight through accessories. Because this is such a low-cost model, there isn’t a timer or thermostat included. Instead, this unit works with a preset temperature of about 145°F. As a result, the Presto Dehydro is a good dehydrator for fruit, fish, meat and jerky. If you want to dry delicate herbs, for example, you won’t get the best results. When we mention disadvantages, you have to keep in mind this machine’s modest price-tag. This model is a cheap way to try out food drying but has one set temperature, so it’s not versatile. Furthermore, accessories and extra trays can be pricey. Finally, since you don’t get a timer, you will have to check on your food to make sure it’s done. Most people who want to buy a kitchen dehydrator will choose one with a reasonable price-tag. That’s why we’ve decided to include this model in our food dryer reviews. It might not have all the features of expensive units, but it offers a lot of value for the money. This counter-top food dehydrator is compact and lightweight. It features a heating element in its base and a fan that helps keep a consistent airflow. When it comes to controls, this is a straightforward unit. It only has an on/off switch so it makes it simple, but not very versatile. When you start using this meat and fruit dryer, it will reach a top temperature of up to 180°F, so you will have to keep an eye out on your food. When you buy this model, you get six trays, including a lid, that stack on top of each other. They are made from see-through, food-safe plastic, so it’s easier to track the drying process. As far as shelf height goes, there are two options for every user. The first option is for thin slices with regular stacking, and the other is for thicker sliced food and relies on tabs. When it comes to price and features, this is another model that sits somewhere in the middle. This food dryer offers a bit more temperature control over entry-level units. It also comes with two two types of trays for added versatility. This kitchen dehydrator has a heating element on the bottom along with a fan that provides good airflow. Wanting to make this a simple-to-use device, Waring designed a dial that has four settings. These presets are “fan only”, “low”, “medium” and “high”. According to the manual, low is around 110°F, medium around 140°F, and high about 175°F. If you don’t know your temps, this means you can dry veggies, fruits, and meats. As far as trays go, this dehydrator for vegetables and meat comes with five that stack one over the other. They’re made from food-safe plastic and have a wider than usual mesh. This makes them better for meats and larger chunks of food in our opinion. Since there’s no way of changing the height between each drying plate, you will have to be careful when cutting up veggies or protein. For those that like to make fruit leather, there’s also a solid tray included in this package. All in all, the Waring Pro DHR30 is a great food dryer for jerky, rolls, and vegetables. While trying this model out, there was one flaw that stood out. Namely, the meshes on each interlocking shelf are wide and small pieces of food or herbs can fall through. Other than that, it was a bit louder than other units. The designers behind this food dryer worked hard to combine great looks with function. The final result might not be ideal, but this unit can handle a lot of produce. The L’Equip’s 528 is perfect for herbs and flowers, among other things. It also comes with a useful instructional and recipe book for beginners. This Korean made food dehydrator is lightweight at 11 pounds, but on the larger side at 10 x 17 x 11.8″. The Heat for drying comes from the bottom and gets pushed up with the help of a fan. With this jerky and fruit dryer, you get six trays in total, with 12 being the limit. Each of the six shelves has a fine mesh insert which prevents diced foods or herbs from falling through. On top of that, there are two fruit leather sheets in the package. Located on the bottom are two different controls. There’s one on/off switch and a temperature dial that goes from 93-154°F which works with a heat sensor for reliable drying. We didn’t find a limit to how much this food drying unit can handle, but tests show it can work with 6-7 lbs or jerky or fruit. That is more than a good result. When we put this food drying machine to the test, we discovered a few minor issues. The biggest one is that it’s not recommended to put the trays in a dishwasher. Besides that, we had to move shelves more often than we’d like when the dehydrator was filled. The second Nesco food dryer in our reviews is another affordable model and comes with a few useful accessories and features. That way it can handle all sorts of vegetables and fruits, as well as jerky. This is one more unit ideal for light to moderate use. The heat source and fan on this food dehydrator are built into the lid. You can control the drying temperature with a dial which also turns this device on. The available range goes from 95°F to 160°F. For quick help, Nesco has a temperature reminder printed on the top. As a stackable unit, this model comes with five plastic trays. There are also a few other accessories included which make the Nesco FD-61WHC the perfect food dryer for preparing fruit treats and snacks. First of all, you get a solid fruit roll sheet for drying out jams. Then there’s a jerky gun which can squeeze out fruit puree or minced meat. This gun has three attachments of its own: two for tube shapes and one for sheets. Other than that, there’s a clean-a-screen for herbs and foods that tend to stick to trays. Although this model tried many things well, there were some issues that we have to mention. On high settings, this dehydrator for fruit can run hot. Thus, you might need to lift the lid occasionally to prevent overheating and damage. This problem solves itself because you need to check food and rotate packed trays anyway. For the price of a basic unit, you get a lot of features with this food dryer. Unlike other models, even more expensive, this one has a stainless steel base and digital controls. It has enough room to fit a large amount of produce, but at the same time doesn’t take up much space. This food dehydrator has a heat element and fan in its sturdy metal base. It comes with 5 BPA-free plastic trays that stack and a few accessories as well. There’s a solid sheet for making fruit rolls and a finer mesh sheet that’s ideal for herbs. Once you’ve placed everything inside and put on the lid, you can program the digital panel located on the front of the base. With these controls, users can set temperature in 5-degree increments, from 100°F to 160°F, and drying time (up to 48h). Another useful feature is the automatic shut-off which makes dehydrating food easier. The lid on this unit is clear so that you can check progress at any time, at least in the top tray. Overall, the Hamilton Beach 32100A is the best food dryer for the money in our opinion. However, there are a few downsides, but they are not significant enough to leave a bad impression. First, the fan can be noisy if you are near this machine. Aside from that, we had to rotate trays with more food, and the temperature was a bit lower than what the controls showed. The final model in our round-up is another affordable Nesco. 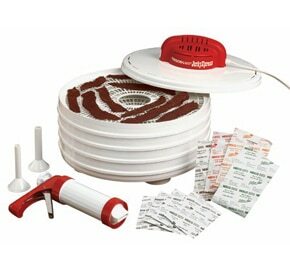 Geared towards jerky lovers on a budget, this is considered one of the highest rated meat dehydrators. It has a few unique accessories to make the job easier. Besides that, it is a simple model that can be a good gift for beginners. This dryer for food has four round plastic trays, each 13.5″ wide. Then there are two solid sheets for making fruit leather and two fine mesh covers for smaller or diced produce. Since this is a jerky making machine, it comes with a gun with three tips to squeeze out minced meat and four packs of different seasonings. You can also use the gun with fruit or vegetables purees and jams to make rolls. The heating element is on the lid, which makes it a vertical flow model that has a fan pushing air down. If you have limited space in your kitchen, you will like this unit. Its dimensions are 14 x 8 x 14″ and it weighs only 5.5 lbs, so it’s easy to move around. Unfortunately, there are no timers or knobs available on this food dehydration machine; it has a fixed temperature of about 165°. Thus, the Nesco FD-28JX is best for making jerky and meat drying, but not so much for herbs. While we tried out this dehydrator for meat and fruit, we noticed that the fan could be quite loud sometimes. Because there’s no timer, we also had to check on progress as well as rotate trays due to minor airflow issues. Stackable or vertical flow food dehydrators have a heating element that is located at the bottom or the top (lid). These units are among the most affordable on the market, but they have their downsides. The biggest disadvantage is the fact that they don’t spread heat as evenly as box and shelf machines. Many models of this type have a fan that improves problems with airflow. With others, users have to check on their food more often and rotate trays on occasion. Vertical flow dehydrators work well for many fruits, vegetables, and herbs. But, when making jerky, you will need to wait longer and have a more hands-on approach. You need to put in more effort to switch and move trays around to get better and quicker results. Horizontal flow or shelf and box dehydrators work more like your typical oven. They have a heating source in the back and a fan that can be at the top or in front of the heater. When it comes to price, they tend to be pricier than stackable models but offer improved performance. Specifically, they’re better at maintaining an even temperature throughout the unit. This is what makes them a superior option for drying larger quantities of produce and for making jerky. Because there’s a balanced airflow, you don’t have to check on these devices as much. This makes them simpler to use, especially if they have a timer included. Moreover, there’s usually no need to rotate trays, so you can start them up and leave them to work. Some units also have an automatic shut-off feature for added safety. Nowadays, shopping for almost anything can be a blessing and a curse at the same time. This is because there’s so much to choose from, even among food dehydrators. There are many models and many features to consider, but we’re going to focus on some of the most important things to steer you in the right direction. The most crucial aspect of every unit is to achieve a given temperature and keep up air flow. Even if you are buying a food dehydrator as a beginner, you’ll most likely want to try out different things. Shelf type units have better clearance for dehydrating taller or bulkier foods, like herbs or spices. Stackable models don’t have much room between each tray, but they can expand with more trays. To avoid the need for rotating trays every so often, you should get a model that has a horizontal design and a fan included. To spend less time cleaning, buy a model which has parts that are dishwasher safe. Before you buy anything, check the warranty length and return policy. Get a unit that has at least a one year warrant. Video speaks more than any photo in this case. Take a look at this two minute footage. To find out more, read our full buyer’s guide. Everyone loves a crunchy texture, but it is most often associated with deep frying and unhealthy diets. If you dehydrate your food, dull vegetables like kale and spinach or fruits can be turned into delicious and long-lasting treats. If you mention dehydration, you have to mention jerky. But, beef is not the only meat that can be dehydrated. Fish can also be preserved into something tasty. A lot of the time, store bought herbs and teas are bland or have added flavors. They can also contain fillers or harmful preservatives. Growing your plants isn’t hard and dehydrating them is easy. Once you try homemade mint tea, for instance, you will never look back. 1. What are food dehydrators? These are appliances that help remove water from a variety of foods. They dry out produce through the use of hot air in a contained space. Nowadays, there’s many affordable and compact units that fit most kitchen counters. 2. How does a food dryer work? A dehydrator heats up enclosed shelves or trays that can be filled with meats, fruits, vegetables, and so on. With the use of heat, water evaporates which helps to preserve food and keep its natural flavors and nutritious value. Two things are required to make jerky or dry out other produce: temperature and airflow. To achieve a certain temperature, these kitchen appliances for drying use heaters. For airflow, manufacturers either use a design that promotes it, or they add a fan. Good airflow is important because it helps maintain temperature and remove moisture. 3. What are the advantages of drying food? The biggest advantage to drying is that you can preserve it for a longer time without using any chemical additives. Low moisture content helps prevent the growth of fungus or bacteria. Furthermore, with water removed, flavors get concentrated so your food can taste even better. Also, storing dried produce is more efficient because it takes up less space. 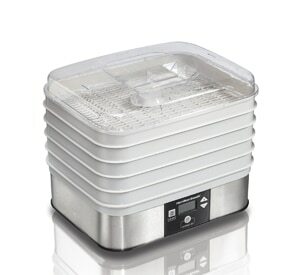 Finally, kitchen dehydrators preserve most of the nutritional value found in vegetables, fruits, etc. 4. What types of food dehydrator can I buy? In general, there are two different kinds of dryers i.e. shelf, box and stacked. Box and shelf have separate trays and a container to store them. With these units airflow is horizontal, so it comes from the sides or from behind. Stacked food type have trays which you place on top of or under a heating element. 5. How long will it take to dry food? The length of time it takes to complete a drying process depends on few factors. These factors include the humidity levels, water content, how thick you make your slices and what type of produce you want to dry. It will also depend on the quality of your dehydrator. Generally speaking, you will have to wait at least 5-6 hours up to a day or more. 6. How long will it take to dry food? The quickest and easiest way is to touch it. It can feel hard, leathery, moist or sticky, depending on how long it’s been drying. When you’re using touch to find out if something has dried, you should remember that warm food feels softer. Thus, you can take one piece out and let it cool before turning off the food dehydrator or taking the trays out. 7. What kind of food can dry in a dehydrator? This can depend on your food dryer features, but in general, you can dehydrate most produce. This includes different fruits and vegetables like apples, oranges, peppers, tomatoes, mushrooms, etc. You can also make beef jerky or dry flowers, herbs, and spices. 8. How do I store my dehydrated food? Once the dehydrating process is over, you will have to wait for it to cool down. Otherwise, you might end up with condensation, and moisture can lead to bacterial or fungal growth. The next step is to condition what you’ve dried. This involves storing it in jars and shaking it once each day for a week. If you notice condensation during this time, you’ll have to pop it back into the dehydrator. If you don’t see water droplets in your container, you can store the finished product long-term in few ways. Vacuum sealing offers the best shelf-life, but jars with air-tight seals or freezer bags are also an option. 9. How long can I store dehydrated food? Food that has been dehydrated can last from one to the next season. If you’re drying tomatoes from your garden, for example, first uses up dried ones and then replace them with the new harvest. Herbs for seasoning or tea can last for years when dried. If you dehydrate mint or rosemary plants, you can make tea for years to come. 10. Are there any food dehydrators for beginners? Yes, there are many affordable models to choose from which are perfect for people who want to try dehydrating. Besides manuals, many units also come with recipe books to help newcomers out. 11. Can I make dehydrated food for camping or backpacking? Yes. The advantage to dehydrated snacks is that you can take them anywhere with you. Dehydrated fruits and vegetables take up little room; they are light in weight and last a long time. The only thing you need to do is pack them in an airtight container. 12. Is it expensive to use a dehydrator? No. Even though dehydrators can run for twelve hours or more, they aren’t costly to use. The price of electricity ranges from about 6 cents to 20 cents across the US. Depending on where you live, a 600 W (0.6 kWh) unit running for twelve hours will cost you from $0.40 to $1.5. A lot of these products have a capacity of 4-5 lbs., so using them isn’t expensive. 13. Can dehydrators be used for something other than food? Yes. For example, you could make fire starters for camping from used up coffee grounds. Another use for food dehydrators is drying paper mache projects. Many people also make treats for their pets from leftover meat. Some people even use these kitchen appliances to dry out delicate items of clothing. You can find more information and guides online. 14. How do I clean my food dehydrator? Trays and shelves have to be washed after every use. Most often, manufacturers recommend using warm, soapy water and a soft pad or brush. Not all food dehydrators have parts that are dishwasher safe, so always read your manual. What’s more, always avoid submerging and take care while cleaning the base or any element that has electrical parts. Considering different budgets and various needs, we managed to come up with our choice of the best food dehydrator. After trying out and reviewing many models, we singled out our favorite one. It is not the ultimate unit, but it has a good set of features. It can cover a lot of ground for the majority of people who want to dehydrate food and won’t be a significant investment. Why did we choose the Nesco FD-75A? For a more affordable price, this unit has a vertical flow design. To help improve airflow, Nesco has developed the “Coverga-Flow” system. To help beginners out, this model also includes a recipe book with temperatures and drying times. The adjustable dial offers a temperature range from 95°F to 160°F, excellent for anything from herbs to meats. We know that this model might not suit everyone’s requirements. You might be looking for something with different features, or at another price-point. If that’s the case, you can read our reviews to find the right one for you.